A few of our advent activities are regular must-do-every-year ones. One of those is salt dough! 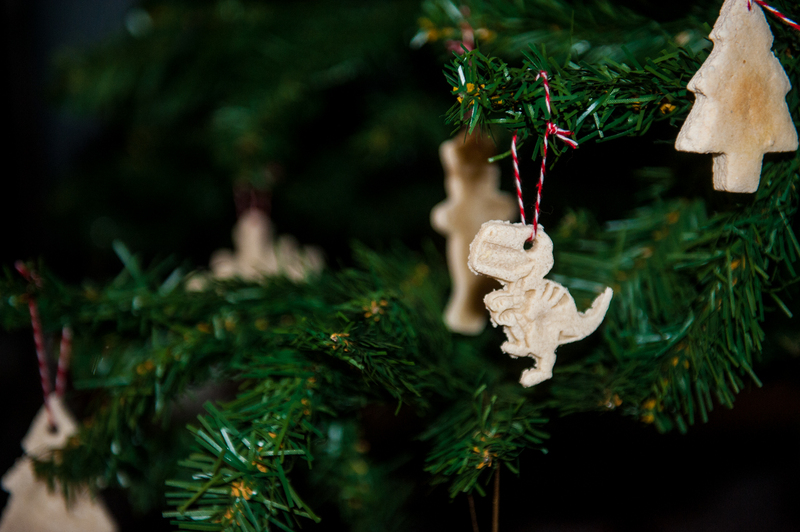 It is super easy, and the kids love being able to make-and-bake their own ornaments. This year we ended up with two dinosaurs, a hippo, a crown, a heart, a car, a christmas tree, and two baubles. We use a base of 2 parts flour, 2 parts salt, and 1 part water. Mix, roll, shape and bake at 160* for 10 minutes or until firm. Before putting them in the oven, I used a norwex stainless steel straw to pop a hole in the top, and that was much easier to thread our twine through than the usual tiny hole made by a skewer! I’m not sure they baked quite enough, as some of the backs were a bit soft as they came off the tray, so we will have to make a decision on if they are storable before we pack up the Christmas tree. But even in the worst case, and we have to turf them, we know there is another set waiting to be made next year!